Our aim at StartupJuncture as from the start been to contribute our fair share to improve the Dutch startup ecosystem. As one of the players in the ecosystem our role has been that of making insightful information about the ecosystem available to everyone and give a pulse of what’s happening in the scene at any moment in time. One of the things that has been in the making over the last few years is an annual overview of venture backed investments made in Dutch startups. The first Dutch Funding Overview covered 2014, when Dutch startups raised 500 million euro. In 2017 we counted 442 million euro, based on the criteria we have established. As always we depend fully on the announcements made by startups, investors and others about funding rounds. We strive to give an accurate account as humanly possible about the state of startup funding in the Netherlands. Our overview is based on the investments we’ve listed or were reported to us. In other words, we cannot do this without you. So do please inform us about the funding rounds we have missed before we publish the overview. In this regard we cannot thank The Dutch Ministry of Economic Affairs, Thomas Mensink from Golden Egg Check and StartupDelta enough for sharing their data with us. Special thanks goes to Thomas Mensink. He didn’t only offer us data before our publication. Taking our publication as the basis Mensink put some extra work in getting into the nitty gritty of Dutch startup funding in 2017. Though we consider that the Dutch Funding Overview gives an accurate picture about the state of funding in the Netherlands we are not dogmatic about it. The overview can accordingly be regarded as a ‘living document’ that is continually perfected. Therefore we welcome the extra effort Mensink has taken to provide us with new and deeper insights on the Dutch startup ecosystem. Here is without further ado the article Mensink published earlier on Medium. We tried to give a better indication of investment amounts that were not disclosed, by looking at the ‘sweet spot’ and track record of the investor and make an educated guess. Our entire list of startup deals including size, series, categories and Dutch investors involved can be viewed at the bottom of this post. Our dataset includes 122 deals, with a total funding amount of €646 million. This is €204 million more than what StartupJuncture calculated. On average, each deal was €5,3 million. Most companies mention they will use the freshly raised capital for international expansion (even though successful Dutch scale-ups wait several years before they grow internationally). The companies that raised the most capital in 2017 are: Picnic (€100M), Messagebird (€52M) and Xeltis (€45M). (Protix also raised €45M but we’re not sure what part of that is equity investment). We categorized each startup using (more or less) the same list of categories that Crunchbase uses. Startups can have multiple ‘tags’. In terms of the number of startups that raised capital in 2017 (so not the total amount raised), ‘software’, ‘e-commerce’ and ‘travel’ were the top categories. You might have expected hot topics like artificial intelligence, robotics, blockchain and VR/ AR in this list, and they are, but apparently not in the top list. Two explanations here: 1) the dataset with categories (based on Crunchbase) might be incomplete (e.g. only mentioning ‘software’ and not (also) ‘artificial intelligence’) and 2) probably it takes time before startups in hot markets scale enough to raise venture capital funding. The average dealsize in 2017 was €5.3 million, but that doesn’t really say much. We categorized all deals into seed, series A (first VC on board), series B and series C. We captured 46 seed deals and 52 series A deals, so we probably missed some seed deals (although we see that many startups skip seed and go directly to a series A). There were only four series C deals: Xeltis, Luxexcell, BUX and iWelcome. As expected, subsequent rounds are higher in size: the average dealsize grows from €730k (seed) to €4.7M (series A) to €14.8M (series B) to €18.8M (series C). Are these dealsizes similar for companies in software, medtech, cleantech and high-tech? 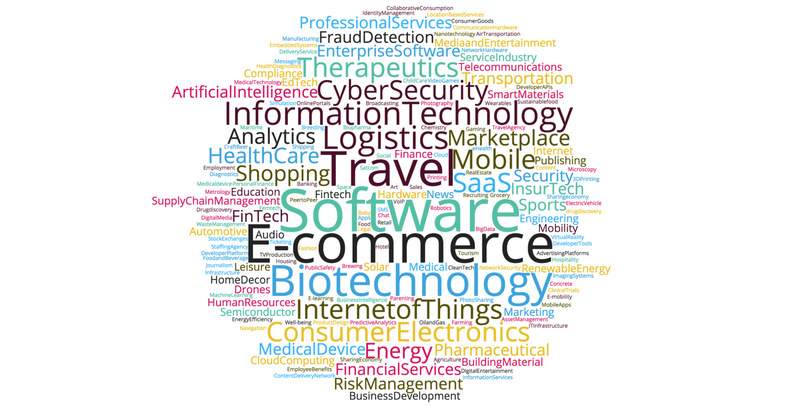 We also categorized all companies into four groups: Software, Hightech (incl. hardware and agtech), Medtech (incl. pharma & biotech) and Cleantech. Software had most deals (72) and the highest total amount invested (€360M). The average dealsize per group are displayed below (we excluded series C rounds here because the 0, 1 or 2 deals per group would give a distorted image). The seed round is fairly similar across all groups, although hightech startups have the highest seed amount on average (€1.1M). Medtech startups have raised the highest series A (€7.3M), while software startups have raised the highest average series B (€16M). This includes the €100M mega series B round of Picnic. Without this deal the average software B round would be €7.7M. The rounds are quite similar, except that the median value for the series B is much larger for hightech companies. Some VCs also invested in foreign startups, like Volta Ventures. These deals are not included in this overview. Value Creation Capital also includes the Security of Things fund and the TechNano fund (managed by Value Creation Capital). Roughly one third of the startup deals was with a Amsterdam-based startup. Amsterdam is, again, the capital of venture capital. Not so easy to find out, but we looked at the companies that were explicitly mentioned as spinoffs of a university or knowledge institute. TU Delft created the most funded spinoffs, all of them in seed round (many of them funded by UNIIQ and/ or InnovationQuarter). The University of Twente is a good runner-up with 5 funded startups, but interestingly these startups have raised later rounds (1x seed, 1x series A and 3x series B), perhaps indicating a good ‘flow’ of capital as spinoffs grow bigger. I’m pretty sure we missed some deals and miscategorized some startups. Nevertheless we think that this analysis gives some additional insights to the Dutch funding ecosystem. At least it did to us. If your (portfolio) company is not in this list, please keep us updated with future deals! This post was originally posted on Golden Egg Check’s blog on Medium. If you want to be kept informed of new posts of Golden Egg Check you can or follow their Medium channel. This makes the total amount not €646M but over €655M!